We were on vacation last week and spent the first night in La Grange, Texas. This windmill is on the property of the Texas Heroes Museum. The building you can see a piece of is the old Jail in La Grange. 0273003Windmill in La Grange TexasLa GrangeTexasThe Old JailThe Texas Heroes Museum. La GrangeThe Chicken Ranch Is HereWindmillHistoryHistoricSkyMetalWaterCOPYRGHTAll Rights ReservedNikon D850Lgood Photography. You did a terrific job of composing and capturing the lighting in this photo. Just love the light in this image !! Magic indeed !!! This is beautiful, Linda, such pretty tones & I love the composition. Love the old windmill Linda & a great POV! Great shot of the windmill and old jail! La Grange is home to some of the best homemade Kolaches in Texas! I hope you tried a few while there! Nice light and interesting old structures! 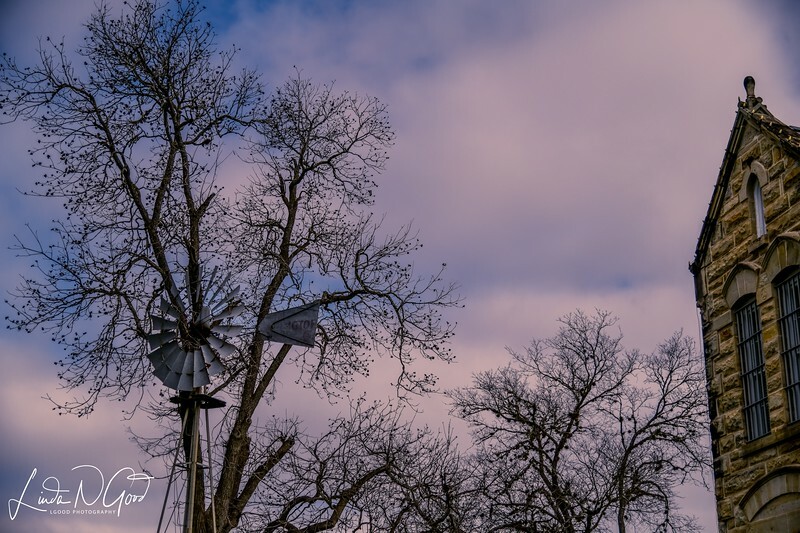 This is so lovely, with the delicate tracery of the tree branches and buds and the neat windmill in the foreground....all against that wonderful sky!